We were excited to photograph Amanda and Jake’s November wedding at Wolf Oak Acres. We’ve known Amanda for many years and were so happy for her when she and Jake got engaged. We were very honored when they asked us to be their wedding photographers. A November wedding can be chilly and the weather was cool, but this romantic shot by the pond certainly warmed up the atmosphere. 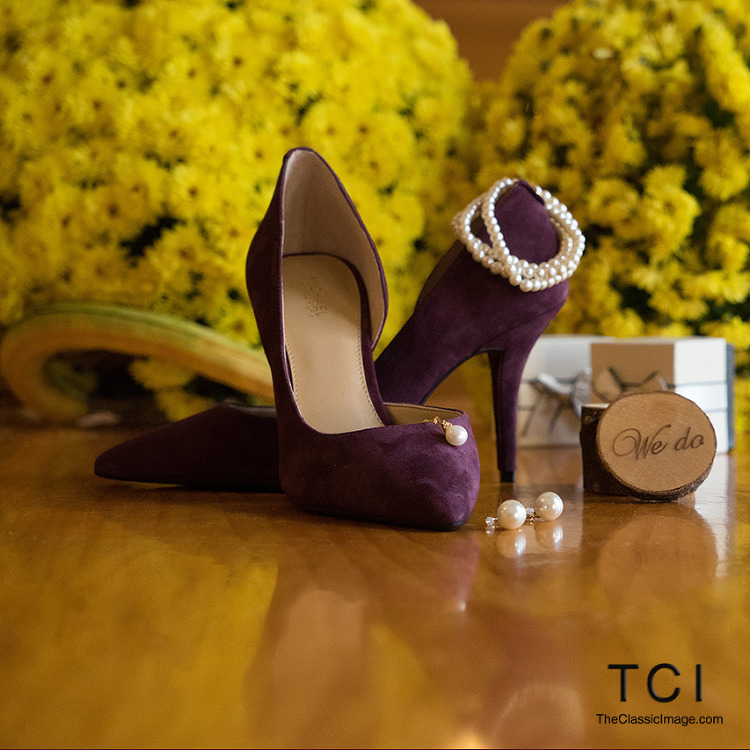 A couple sweet detail shots from the wedding: the shoes, the flowers and the ring box. 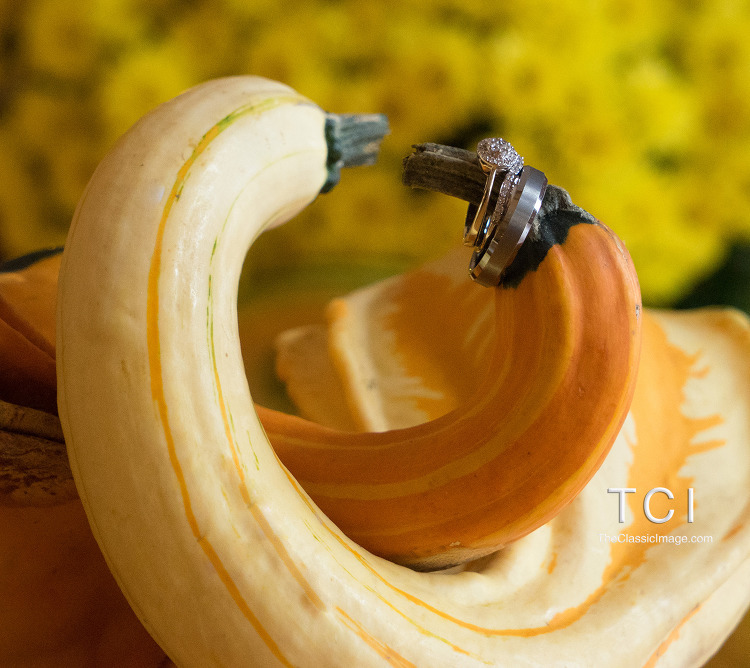 And the rings with the fall decor of decorative gourds and and fall flowers. Amanda’s daughter Addy was the junior bride and she looked like a princess in her beautiful white junior bride’s dress. Amanda looked gorgeous from beginning to end. I love the contrast between the pearls and flannel. 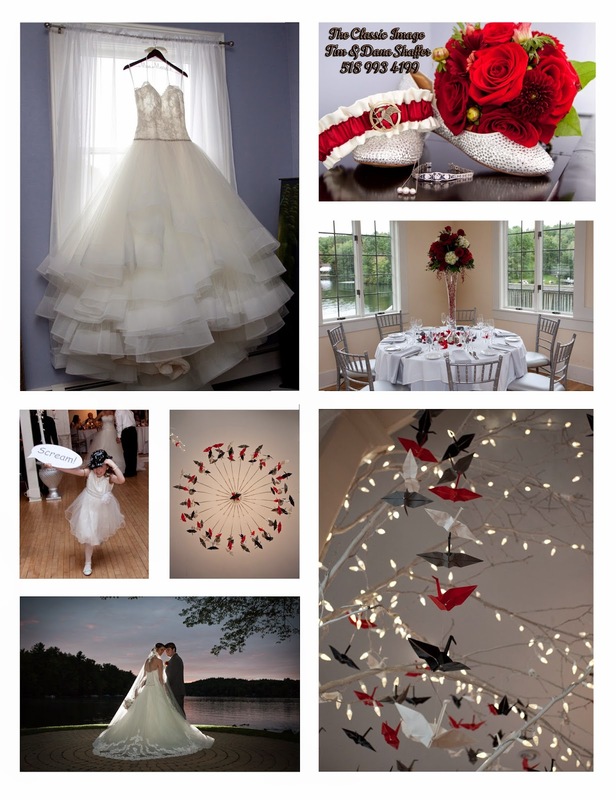 Elegance and country casual….Amanda is just the kind of bride who can pull off both looks. I love this mommy daughter getting ready shot with Amanda’s mom helping her and Amanda helping Addy get dressed. Another great shot from the bride and groom romantic images. Yes that beautiful moon was there shining brightly on our couple. We did have to work quickly to get these shots as it was getting chilly! Dinner was delicious! It was a Thanksgiving theme wedding dinner so there was plenty of turkey mashed potatoes and gravy along with all the other trimmings. Pumpkin pie and apple pie were served instead of cake. They even cut a pie instead of cutting the cake! Sweet! When we talk to our couples we ask them what is important to you, what will you want to see when you sit down to look at your photos and your albums after the wedding. Amanda and Jake agreed that family was the most important thing to them in their lives. Amanda’s children Addy and Will were just as excited to have Jake become part of their family as he was to become a daddy to them. Isn’t this the sweetest sand ceremony you’ve ever seen? And this sweet end of evening s’more table. What better family oriented kid friendly wedding night treats for a cool November night? Ashley and Jay’s Cooperstown NY was every bit as wonderful as you can imagine it would be in a village who’s tag line is “America’s most perfect village“. A sunny September day with a few puffy clouds, not too warm but still nice enough to enjoy the tent reception at Ommegang brewery once the sun went down. We took a few photos at the Otesaga on which is situated right on Otesego Lake before we headed a few miles out of the village to the Ommegang Brewery site. Our friends at Mohican Flowers did the flowers and decorations for this event. Don’t you just love the different shades of burnt orange and peach together? Cooperstown even pulled out all the stops for this wedding even giving us that amazing sunset looking through the main gate. Thanks for having us photograph your wedding Ashley and Jay. Wishing you much love and happiness in the future. Cheers! This past summer we finally had a chance to attend the Saranac Brewery Hop Harvest held in Upstate New York. It was a great experience to be able to assist with the harvesting of the hops that Saranac uses to make some of their craft beers. Our reward for volunteering was some great food and some awesome beer. We weren’t the only ones working or having a good time. Whether you are working or drinking out doors in the sun it’s good to have a brim on your hat to keep the sun out of your eyes. The beer tent was set up along the edge of the cornfield. Wrobel Farms is well known in the area for their delicious sweet corn, but you have to know enough to tell the difference between that and the field corn which grows right along side of it, or you might be disappointed. No disappointment here though. I am an IPA fan and Saranac Legacy IPA is one of my favorites, I’ll admit I got in line more than once. A nice close up of Wrobel Farms heirloom hops. Take a few in your hand and crush them so you can smell the delightful scent. New York State farmers have been growing hops to make beer since the 1800s. We had hops growing in our yard in when I was child and my mom used to make pillows to use as a sachet; sewing dried hops inside. The large poles are spaced 50 feet apart then strung with wire . Then coconut hull twine is hung down from the horizontal wire for the bine to crawl up . This is the whole group of Hop Harvest attendees. If you look closely you can see our hosts, Jim and Susan along with the Saranac crew including a couple of representatives of the Matt family themselves! To attend you need to register ahead of time through Saranac’s website, agree to participate in the harvest and of course be over 21. After experiencing how hops were picked a hundred years ago, it’s great to sit down and have a beer on a hot day. I loved this woman’s protective apron. Perfect color for harvest. I think Jim needs to update his farm Tshirt to one that includes a few hops. Seriously though, thanks for having us. We had a great time and hope to make it again for the 2017 Harvest! PS Can’t get enough of hops, craft brew and breweries? Check out some of other posts. Good times! Whether you decided together or one of you asked and the other said yes, you’ll want to share that with your friends and family and shout it to the world. One nice way to do that is to meet with a photographer and have a few photos taken. Tell us your story and together we can make some beautiful images to use for announcements, save the dates or sharing on social media. While we are doing that we can also all get to know each other a little better and we can show you how amazing you look in our photos. When the wedding day is here, you can be more comfortable in front of the camera knowing that you are going to look awesome. This weeks featured couple is Eliza and Mike. We set up our on location engagement sessions utilizing a spot that has special meaning to you or reflects your style. We are also always happy to suggest places that we think will work best for you. Here is an example of an on location session that incorporated some special places to the couple as well as a spot that we had in mind because we love the way it looks in Autumn. That great big tree is pretty awesome. It stands way out in the middle of field on some farm land and we drive by and often stop to take a photo of it just because it’s beautiful in every season. It is also on lot near Eliza’s house where she grew up so when we mentioned that in our consultation, she was looking forward to see what we could create using the tree as a focal point in their photos. We got some really cute photos and the perfect one for the cover of their sign in album. That really sweet fence is part of farm that belongs to a mutual friend, so we got permission to use that and it was perfect! The leading lines that bring you right to our couple and the great light helped us create a classic engagement portrait in a beautiful country setting. The more relaxed image with Eliza leaning on Michael’s knee really reflects their fun genuine personalities. And if they look a little more at home in that photo, it’s because they were. We look forward to working with these two at their October wedding this year.